Sometimes it's good to stop at the end of the year to look back and assess how much you've accomplished, if for no other reason than to make sure you've not wasted a year of your life. Life takes on another dimension when you throw travel into the mix. Had it not been for travel, we might have missed out on everything from the fun of ringing in the new year atop a high rise in Panama City with a fellow travel blogger … to the nightmare of being escorted out of a country. Here is one year in our lives as travel bloggers, 12 photos, 12 months. After ringing in the New Year, we drove to the other end of the country for a little R&R. Nestled in the mountains is the little city of Boquete. It's a very popular expat community and a great place to relax. It may be Mardi Gras in New Orleans, but it's Carnival in Panama City. Costumed devils, floats, packed streets, food vendors and a parade made the celebration special in Panama City. This annual event was fun, but our feet were exhausted by the end of the day! We spent most of March in Israel and had a blast. After ten days on a fascinating guided tour, we rented a car and set out on our own to see more of this tiny nation, basically everything from the northernmost tip at Tel Dan all the way down to the Gaza Strip near Egypt. I don't know what we enjoyed most, the food, the people, or seeing the historical sites that we've read about all our lives. You can take in the sights of Jerusalem's Temple Mount and the Wailing Wall from a nearby perch. Our last month in Panama. we spent as much time as we could with the friends we'd miss. Tops on our list is our Dutch friend Farieda. We “played tourist and went sightseeing and bar-hopping in “Casco,” the oldest inhabited part of Panama City. We moved to Cuenca, Ecuador in May. With half a million people it's the third largest city in the country and a very popular retirement spot for Americans because of the incredibly low cost of living and the year-round spring-like weather. In June ,we visited the easternmost part of Ecuador, part of the Amazon River basin. We stayed at a beautiful lodge in the jungle for a few nights, traveled on an Amazon tributary. We even managed to see Banos, a town sitting on the side of a volcano that is famous for its thermal baths. Sadly, Dan missed a unique photo op: Only three days after we left, the volcano erupted. In July we decided to return to the US to visit family, especially grandkids and Linda's 88-year-old mom. We enjoyed beach time in Naples, Florida, visited The Biltmore in Asheville, NC, and enjoyed time in Richmond and Petersburg, two Virginia towns with a lot of Civil War history. Back in Cuenca, we took time to get to know the mountain town better and improve our Spanish. September through November are major travel months for us. Before heading to Ireland for a press tour and conference, we took a tour of various Inca ruins near Cuenca. After our conference we rented a car and drove north so we could spend some time touring Northern Ireland. Since we were already in Europe our friends Sven and Tina, who we'd first met in Israel, invited us to visit them in Cologne, Germany for a while. We then flew to Rome, because we'd found an incredibly inexpensive cruise. It took us to cities in Croatia, Italy, Montenegro and Greece. Dan's favorite stop was Burano, an island neighbor of Venice, because of its mega-colorful houses. Burano after sunset still maintains its colorful beauty. November began with a few days in Athens, Greece, then a week of downtime at an apartment in Madrid. We flew back via Lima, Peru, then to Guayaquil, and the immigration in Ecuador kicked us out because we had used up our days in country. So off to Florida to straighten out our visas and spend some time with Dan's family in Sarasota. If you're ever there in November be sure to see the annual Sarasota Chalk Festival. Artists start fresh after a night of rain during the Sarasota Chalk Festival. Dan spent much of December going through old photos, while Linda worked on various computer issues and social media. Our last bit of travel was Lights In Bloom, another annual Sarasota event. This one was held at Selby Gardens. 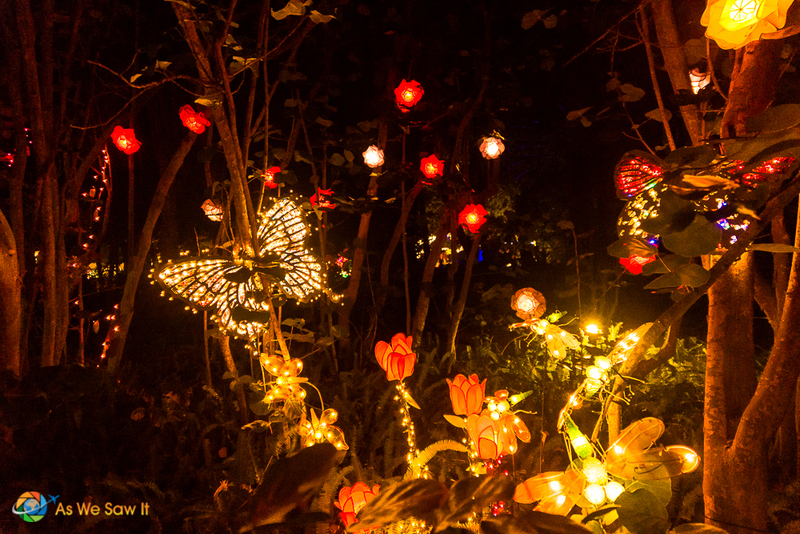 The entire botanical garden is open from 6-9 pm and is ablaze with colorful lighted flowers, butterflies and more. We also managed to visit the gardens during its normal daytime hours. They specialize in epiphytes so they have a world-class collection of orchids, bromeliads, and other air plants. I already visited Ireland but Eduador is only a dream. I want to see the ruins there they could remind me of my previous live there. I need to know if I can visit Ecuador now in the spring or I better wait for the summer? Spring is definitely better. If you plan to visit the mountains in June, July or August you will need warm clothing. It’s winter in South America and the cold winds travel up into the Andes. Yeah, that’s the challenge: if I wait until I get home I forget some things but if I write as I go I miss others. The photos are a good memory-jogger and we try to schedule down time. We spent a week in Madrid before we left Europe and spent so much time working we didn’t tour a thing! what a fantastic 2013 you had! Unfortunately, mine was full of trials and tough times, so I couldn’t travel much and didn’t even feel like writing a 2013 recap on my blog 🙁 I have high hopes for 2014, though! Many blessings in the new year btw. Thanks, same to you! We expect to be in Asia this year so let’s stay in touch. Looks like you guys had a very eventful year! Your pictures of Ecuador are absolutely stunning and the Chalk Festival in Sarasota is something that I would love to see! Happy New Year! Hope 2014 is everything you want it to be plus more!! Sounds like it was a great year for you two 🙂 Our year was a busy one as well! Here’s to a happy, healthy and prosperous 2014! Here, here! What are your plans? We do have a lot of photos of the Amazon basin but I could only put one photo per month in our post. If you’d like to see them, they’re in our Ecuador photo gallery. Most of the albums are from our Amazon tour.